5 Reasons to Visit Your Pediatric Dentist in Birmingham! Summertime is the best time to get caught up on anything that you’re not able to do during the school year—even visiting your dentist. Sometimes, it can be difficult to find time to schedule an appointment between multiple work schedules, athletic practices, and getting the kids to school on time. But now, that’s one less thing you must worry about. Here are three reasons why you should take your kids to visit their pediatric dentist in Birmingham this summer break. 1. Maintain their relationship with their dentist. 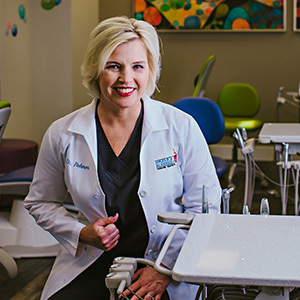 When we accept the smallest members of your family as new patients, our office accepts them as a new member of Dr. Angelica Rohner’s dental family. We have a kid-friendly office environment with staff members that work awesomely with children. We believe building a good relationship with our dental professionals is important to the future of your child’s oral health. You eliminate the chances of your child developing dental phobia or anxiety as a teen/adult by making them familiar with their dentist now. This can save you big bucks in extensive dental care! 2. You get reassurance that your child is developing healthily. You keep your child’s baby teeth healthy by cleaning them thoroughly at home and visiting your pediatric dentist. By neglecting to properly take care of your child’s baby teeth by not following both steps, you may cause them to fall out sooner than they are supposed to. Their permanent teeth are more likely to grow in crooked or out of place when they don’t have a healthy foundation to grow into. Regular visits at our fun Birmingham office can prevent premature tooth loss and keep you up to date with your child’s development. 3. Keep work to keep your child’s mouth clean. Many young children are not able to properly brush their teeth. Parents do step in and help, but sometimes it’s still hard to reach in the back of their mouths—especially when your child doesn’t particularly enjoy having their teeth brushed. Professional cleanings are essential for getting the debris and buildup that have been missed. This can be really important in the summer because your child may be exposed to more sweet summer treats that catalyze dental decay like popsicles, snow cones, and slushies when it’s hot out. 4. They will receive quality preventive care. An essential part of having regular dental checkups is finding cavities before they get worse. Neglecting cavities—or neglecting the opportunity to spot them—leaves room for their adult teeth to grow incorrectly and continue the vicious cycle of bad oral health. 5. They will learn how to care for their own teeth properly. 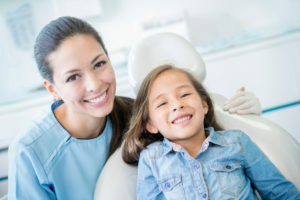 A dental office may not be initially inviting to a child, but we teach brushing and flossing techniques in a fun, inviting way! We can also give parents tips and tricks to make brushing and flossing at home more engaging and easy. We understand the importance of maintaining your family’s health. When you need a gentle dental team to care for your littlest smiles, contact your children’s dentist in Birmingham. We’re here to help you guide your children to optimal oral health. Comments Off on 5 Reasons to Visit Your Pediatric Dentist in Birmingham!